/ Modified nov 12, 2016 1:31 p.m.
Claudio Rodriguez was in a gang when he discovered the Tierra y Libertad collective in South Tucson. 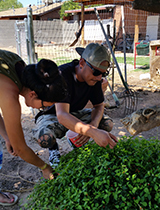 Members taught him how to grow food in the desert, and how to organize for community action. 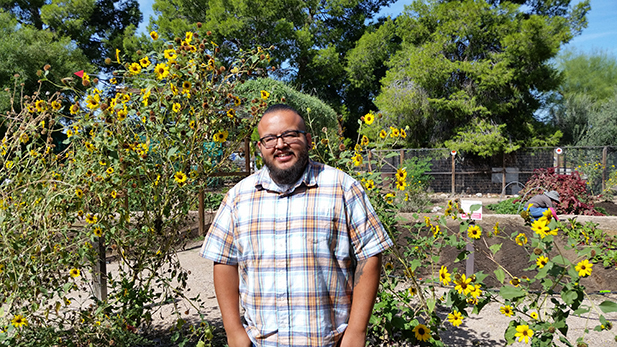 Today, he works for the Community Food Bank of Southern Arizona as a school garden coordinator. Production of Feeding Our Future is made possible with the support of the Zuckerman Family Foundation. That’s Claudio Rodriguez. He just finished teaching a group of elementary school kids about composting. 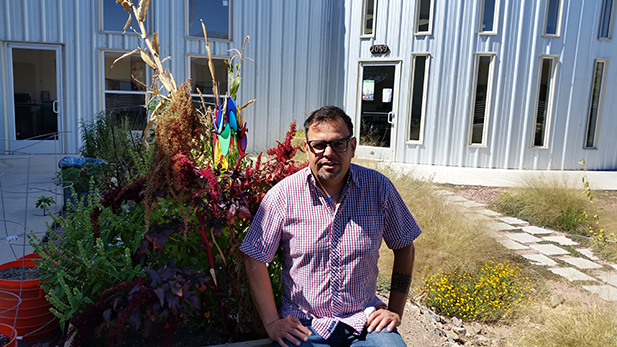 He works for the Community Food Bank of Southern Arizona as a school garden coordinator. The class is over and the kids are running around playing with balloons. There are loud popping noises. He’s only half-joking about the balloons sounding like gunshots. In his life, he’s seen a lot of violence. His best friend was stabbed 23 times by a rival gang member. He died in Rodriguez’s arms. He was 18 years old. So Rodriguez enrolled at Pima Community College. He connected with the Chicano student group MECha. “Some home girl invited me, “Come to this garden, we’re going to plant.’ I said okay,” he remembers. That’s how he discovered Tierra y Libertad. 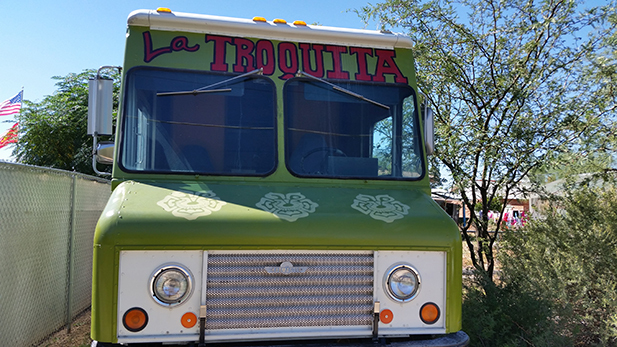 It’s a grassroots community organization in South Tucson. 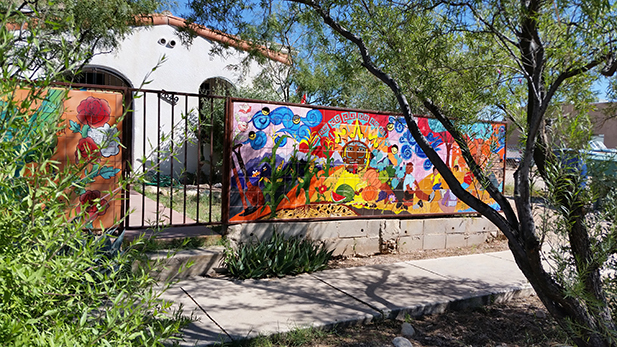 Colorful mosaics invite neighbors to see what Tierra y Libertad, on South 7th Street in the Wakefield neighborhood of South Tucson, is doing. The collective works to transform the barrio and teaches neighbors ways to live sustainably. “Tierra y Libertad means land and freedom. It’s actually an old war cry from the 1910 revolution.” He means the Mexican revolution. 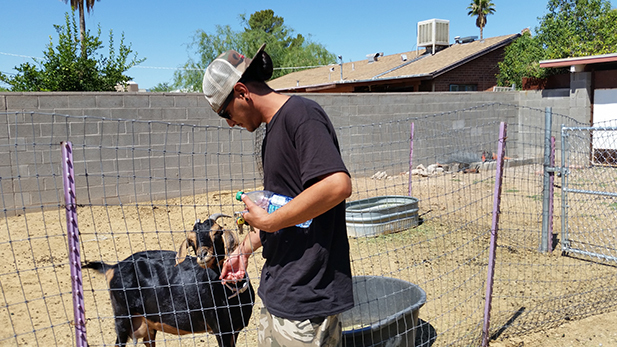 Cesar Lopez is a community activist and farmer in Southern Arizona, based in Nogales. He was an early member of Tierra y Libertad. Rodriguez says Tierra y Libertad has always been about more than food. It’s about teaching people how to create positive changes in their barrios. Then Rodriguez and the other youth went into the community and taught it to others. “It saved my life,” he says. He left the gang. 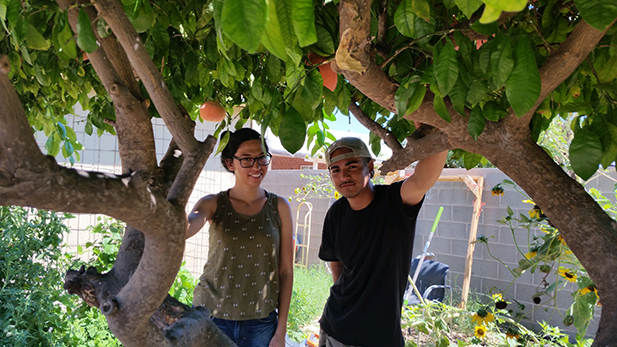 He continued to learn about growing food and community organizing from Tierra y Libertad. “Eventually, it landed me a job,” he says – with the Community Food Bank. Tierra y Libertad turned a dirt lot into a flourishing garden with a green house and aquaponics system. Rodriguez is now the lead organizer for the collective. 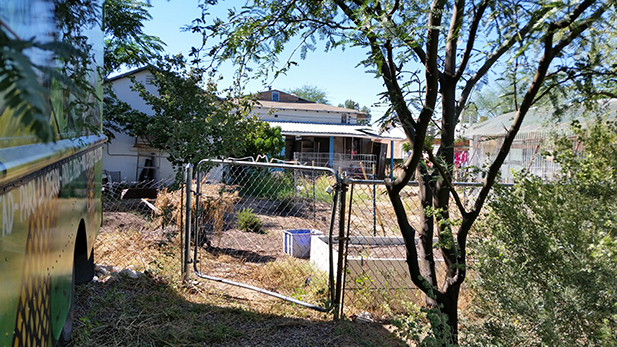 Nine years later, that dirt lot in South Tucson is a flourishing garden. More houses in the neighborhood have gardens and rainwater harvesting. But he says Tierra y Libertad has always been about more than food. It’s about teaching people how to create positive changes in their barrios. Tierra y Libertad runs a migrant protection network and legal fund. Rodriguez is excited about a plan to distribute fresh, organic produce to seniors in the neighborhood. “Tierra y Libertad, they were really, really inspiring for me as a young man,” he says. Romero co-founded a collective in Barrio Centro. It’s called Flowers and Bullets. Dora Martinez (left) and Jesus “Tito” Romero in Romero’s backyard garden in Barrio Centro. Along with a rich variety of vegetables and flowers, they grow fruit trees and raise goats. He’s in the parking lot of the Julia Keen School with another Flowers and Bullets member – Dora Martinez. You can hear noisy cicadas in the trees. And jets from nearby Davis-Monthan Air Force Base. “This is going to happen a lot,” says Dora over the noise. The jet is so low it looks like it’s going to land on the roof. “That’s why this school is closed down,” Romero explains. The Tucson Unified School District closed Julia Keen in 2003, because of the noise. It’s on the flight path. “This was the neighborhood school,” says Martinez. “It was also where folks would come and do their voting. Health fairs or health clinics were also held here. It was really a community center and kind of the hub” of Barrio Centro. Romero says kids used to play here, but the basketball courts were taken out. Domestic violence, unemployment and drugs. Flowers and Bullets put in a proposal to TUSD to turn the boarded-up Julia Keen school back into the beating heart of Barrio Centro. TUSD cut the controversial program in 2012. That same year, Romero and his friend Jacob Robles started Flowers and Bullets. At first, they silkscreened graffiti art on t-shirts and sold them. With their first profits they bought seeds and planted a garden in Romero’s mother’s back yard. At the time, Dora Martinez was working as a field manager for Sleeping Frog Farms, near Benson. She shared her knowledge and expertise about growing food in the desert and harvesting rainwater. Romero says, “Food – everyone eats. It’s a hook” to get people involved and connected in the barrio. Flowers and Bullets members worked together to install 10 backyard gardens, set up rainwater harvesting systems and build chicken coops and goat pens. Tito Romero makes and sells soap from goats milk. 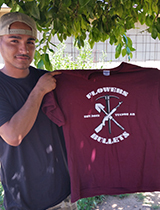 He has a part-time job in Douglas as a ranch hand, and he brings back the skills and knowledge he learns and shares it with other Flowers and Bullets members. Today, there are 23 collective members, and they share their knowledge and expertise with one another. They also share their surplus produce, eggs, goat milk and meat. Martinez taught a free workshop to neighbors on how to harvest goat meat and use the various parts of the animal. These gardens and animals provide low-income families in Barrio Centro with healthy, organic food, and members make extra money selling their surplus and goats milk soap and other home-made products at farmers markets. Dora Martinez says it has raised people’s self-confidence. He’s a former drug dealer. Martinez says some collective members went back and got their GEDs, and others are taking college classes. But she also cautions that no one should romanticize the work they’re doing. That former drug dealer – he’s using again. Flowers and Bullets members went door to door to survey their neighbors about what they wanted to see happen in Barrio Centro. So Flowers and Bullets put in a proposal to TUSD to turn the boarded-up Julia Keen school back into the beating heart of Barrio Centro. “We envision demonstration gardens, healing spaces, art spaces,” she says. He’s also concerned about creeping gentrification. Barrio Centro rents have gone up dramatically in the last few years. Landlords are advertising to snowbirds and University of Arizona students, because the neighborhood is only a few minutes from downtown and campus. Tito Romero ran for a seat on the Barrio Centro Neighborhood Association board. At 28, he’s the youngest member, and one of the few people of color. He just became co-chair. “I’m a warrior for my community,” he says. Tune in to Arizona Spotlight or log on to AZPM.org next week for the final episode of Feeding Our Future: Farmers and Markets on NPR 89.1.